DGW Consulting is an American Indian woman owned business that brings expert knowledge in tribally-based histories and Indian affairs to assist all level of government agencies (federal to local), non-profit institutions, tribal governments, and business in their policy planning needs. Given the increasing recognition of the need to adapt to environmental change as well as the reality of government-to-government relationships between tribal and non-tribal governments, we specialize in environmental justice policy planning through staff training, education, and project-based agency and institutional consultation. Note about cover image: In 2016 five tribal nations on the northern Columbia Plateau–Colville Confederated Tribes, Spokane, Coeur d’Alene, Kootenai, and Kalispel–came together in a historic gathering to reclaim their ancient canoe cultures. For thousands of years Kettle Falls in Washington state was an ancient gathering place for many tribes because of the salmon fishery that sustained them. In 1940 the Grand Coulee Dam drowned the falls, taking with it the heart of salmon and canoe-based cultures in the region. 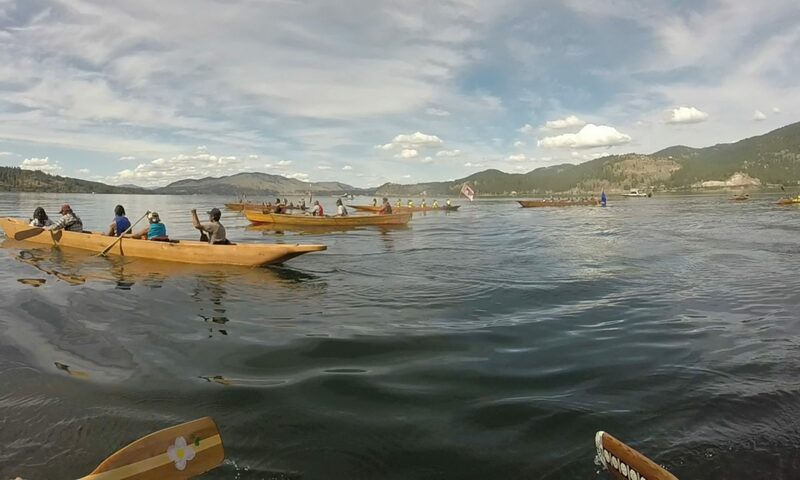 The convergence of the canoes in 2016 was the marking of resistance to this environmental injustice brought by colonization and an affirmation to restore not just culture, but the return of the salmon which are now nearly extinct. As governments embark on environmental justice policy creation, they quickly come to realize that EJ is very different for American Indians than all other populations. Their very different histories, relationships to land, and tribal sovereignty present entirely different sets of concerns compared to other EJ communities. But for most agency officials, these circumstances are poorly understood, if not completely unknown. Even staffs with knowledgeable tribal liaisons and legal departments will not always have the bigger picture when it comes to EJ issues. DGW Consulting conducts staff trainings to clarify these differences and presents salient information and strategies so agency staffs can work effectively with tribal governments. Half-day to 2-day trainings available. The world of environmental activism is vast and highly interdependent upon relationships between diverse groups. These include other non-profits, grassroots and ad hoc community groups, legal communities, permanent and impermanent coalitions, and tribal peoples, among others. History shows, however, that the environmental movement has a checkered and sometimes troubled relationship with Native peoples, and is also as misinformed about the political status and historical realities of tribal nations as most everybody else. As our social relations become more complex with the intensification of environmental disruption, it will be more important than ever for environmentalists and community groups to form strong alliances with tribal peoples. We provide specialized staff training geared toward creating greater understanding and communication across multiple stakeholder lines for more effective and responsive coalition-building. Half-day to 2-day trainings available. Tribal governments have unique needs in environmental policy planning. Interacting with government agencies can be fraught with difficulty and conflict. Having the expertise of a well-trained professional in Indian affairs– one who understands from an Indigenous perspective– to work as your advocate can help smooth things out in intergovernmental relationships. We are available to help educate tribal governmental officials about the finer points of EJ for better policy outcomes. Half-day and full day trainings available. In some places like Southern California development is so relentless that Native burials are regularly unearthed because Native people lack legal power to have their graves properly protected. In these cases a cultural monitor is brought in to oversee the very sensitive and painful process of extracting ancestral remains, inevitably triggering intergenerational trauma for tribal people who must endure it. This results in bitter relationships between tribes and business and an image of business as heartless exploiters of other peoples already-violated human rights. In these cases businesses who truly care about people and are willing to acknowledge the ways they are benefitting from the misfortune of others do well to go out of their way to build bridges with the tribal communities who they are affecting. We can help you navigate these very difficult situations by educating managers and staff and providing mediation services for businesses working with tribes. DGW is available for advising agencies and organizations with more specialized needs on short and long term projects, including webinars, conference proceedings, etc. I am available for consulting and training on topics beyond environmental justice. Are you working with Native communities in other contexts? Are you an educational organization looking to increase your diversity, and to understand the very different circumstances about Native Americans? I can tailor my expertise as an American Indian educational consultant to meet a broad variety of needs. Let’s talk! The core component of the services DGW Consulting provides is education. We understand that environmental justice for Native peoples is a different animal than it is for all other EJ communities. If this is new information for you, you are invited to familiarize yourself further with this concept in three ways. First, Dina Gilio-Whitaker literally wrote the book on EJ in Indian country. As Long As Grass Grows: The Indigenous Fight for Environmental Justice from Colonization to Standing Rock will be released from Beacon Press in spring 2019. It’s a good beginning point for understanding the issues American Indians face in their quest for environmental justice. Second, as the principle consultant at DGW Consulting I teach an introductory online course on the topic through the Center for World Indigenous Studies. The course can be completed in one hour and gives a very broad picture of the concepts I cover in the book. And at $39 its affordable! Follow this link to find it; Environmental Justice in Indian Country. Third, as an educator I teach courses on a variety of American Indian issues. Invite me to give a talk to your group, conference, or other gathering. Please check out my website www.dinagwhitaker.wordpress.com for a partial archive of my written work. If you are considering hiring me as a consultant, I’ll give a one-hour address free of charge (but you’ll have to pay my expenses if I have to travel). This way you’ll get a sense of my knowledge as well as teaching style to see if I am a good fit for your needs.